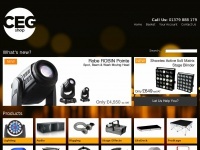 Stocking Prolyte LiteDeck, Lanta Lighting, LED Lighting, Showtec, Rhino Flightcases, Rosco and Dirty Rigger. We are the Staging, Lighting & Sound Equipment Specialists, providing affordable pricing on stage, theatre and concert lighting and sound. two profiles were found for Cegshop.co.uk in social networks. Among other social networks the website is represented in Facebook and Twitter. The web server used by Cegshop.co.uk is run by SoftLayer Technologies and is located in Austin, USA. The server runs exclusively the website Cegshop.co.uk. The website uses the shop software system Big Commerce The website uses the latest markup standard HTML 5. The website does not specify details about the inclusion of its content in search engines. For this reason the content will be included by search engines.